Sarah Palin or Shakespeare? Sometimes it’s Hard to Tell. 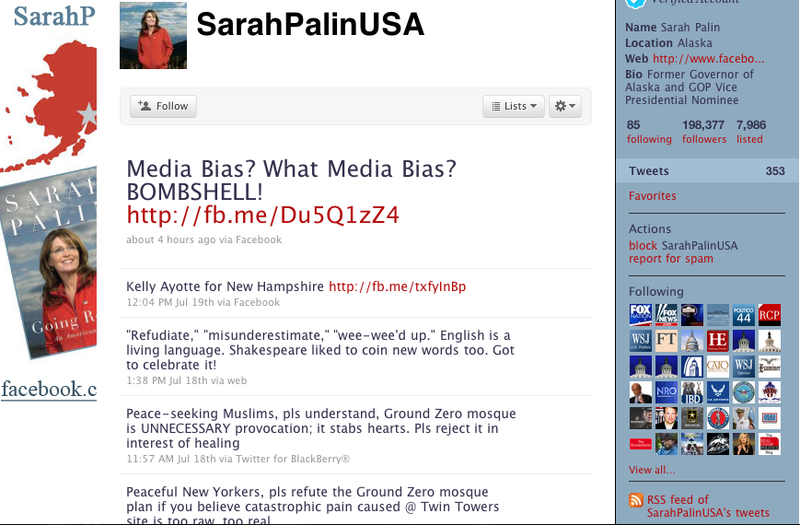 Sarah Palin committed a bush in a recent Twitter battle cry to New Yorkers calling them to “refudiate” plans to build a mosque close to the 9/11 site. “Refudiate” is, of course, not a real word in the same that “normalcy” was not a real word until President Warren G. Harding coined it a hundred years ago – give or take. The offense against the American version of the English language was quickly seized upon by those who (quite rightly) fear Palin and held it up as proof of her already rather obvious lack of dexterity with a language we can only assume she’s been speaking since toddlerhood. Although malapropisms out of the mouths of political leaders actual and wanna be are disheartening, out of the mouth of Palin, it’s not worth a footnote much less a bloggy storm. What’s really eye-opening came on the heels of Mama Sarah’s predictable inability to be chagrined. “Shakespeare liked to coin words too.” she twittered back at the elitist blogosphere. All that glitters is not gold. As (good) luck would have it. Household words. Cold comfort. In a pickle. Devil incarnate. Eaten me out of house and home. For goodness sake. Give the devil his due. Heart of gold. Laughing stock. It was Greek to me. Naked truth. Wild goose chase. What amazes me and seems to have sailed past everyone’s offended ears is that Sarah Palin knows that Shakespeare coined words and phrases that previously didn’t exist in the English language. And I will concede that it’s very possible that her little Twuip was as ghostwritten as her book, but it was clever, and it’s past time her critics realized that she cannot be mocked and jeered away. First, because Palin doesn’t blush unless it will serve a greater purpose. Second, she has a gift for turning faux pas into the “aw shucks, I’m just folk like you ordinary people”. She spins her legend from the ridicule and frustrated rants of the left and the few on the right who see the damage she is doing to their politics – such as they are. Refudiate? I think ole Will could have done better. The things that man could have done with a Twitter stream should leaving us weeping over the drivel that reigns as literary there now. It’s not the worst thing she’s uttered in any medium, but it’s important to remember that she can’t be taken down by trivial nit-picking. She feeds on that like Nosferatu on village virgins. Substance, people. She doesn’t have any. Criticism of her should. That woman is enormously popular. I don’t understand it and I pray it doesn’t go anywhere but I fear the worst. Tomorrow night I’m seeing a production of the Bard’s Henry VI, Part 3. I’m boning up via Cliff Notes. I’m pretty sure it won’t be the same as listening to Palin speak. Her popularity is hard to fathom. She’s pretty. She talks about issues they way most people who only get their information from Fox News do – in cliche and by placing blame on easy targets instead of where it belongs. And she doesn’t ask anything of people except to feel her outrage and expect the government to fix things (right after they vote all the “right” people into office). But people are the same all over. It’s easier to believe that the government is at fault than to admit that perhaps some of the problem is us in one way or another. Ah, but poor addled Henry VI. We could’ve lived back then, eh? The mention of her name makes me shiver; and it’s not just because I’m not Republican. There are many good arguments against her as a political force and a possible ’12 runner, but as she makes it so easy to take potshots – that’s the route her critics go. And it’s stupidly shortsighted. Whatever they may think, the average person doesn’t. She is charming and spins good and she’s a viable threat. She needs to be treated like one and systematically taken apart (which should be just as easy as mocking her really because she is at her core too lazy to do the heavy lifting to fend off a serious attack on multiple fronts for too long). I blame the press. They are little more than entertainment mongers anymore.